« Get ready for the Edmonton Indy 2008! 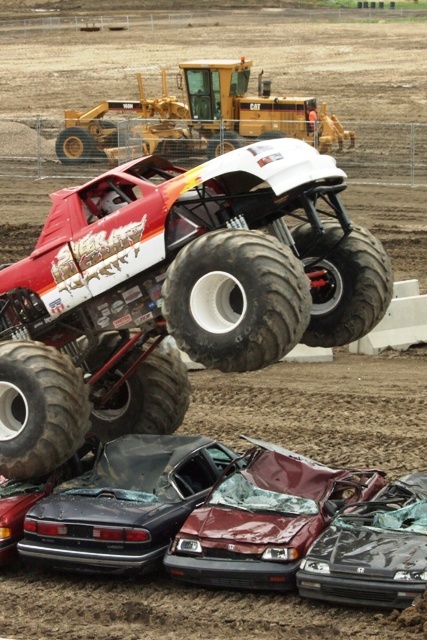 Monster trucks: Gotta love ’em! 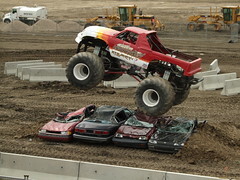 I am a huge fan of both monster trucks, and my new little Fuji F50 12MG compact digital camera. I sat at the top of the stands, opted for the Top 3 shots instead of a single shot, set my ISO to 200, chose a medium aperture, pre-focused on the spot where I thought the truck would be, and fired away. Great jobs done by both “Sheer Insanity” (the truck), and my wonderful tiny camera. Gotta love ’em. Caught the monster truck show, recently, at the Rainmakers Rodeo held in St. Albert, a city just a few minutes drive from my home of Edmonton, Alberta. This entry was posted on Monday, May 26th, 2008 at 5:38 am and is filed under Adventure Travel, Alberta, Canada, Digital Cameras, Family Vacations, New Technology, Photography tips, Sports. You can follow any responses to this entry through the RSS 2.0 feed. Responses are currently closed, but you can trackback from your own site.